The May birthstone: Emeralds were once a favorite of Cleopatra and are said to empower its owner with foresight and bring good forturne. Its rich green hues reflect nature and symbolize fertility, rebirth and eternal love. Legends claim wearing an emerald will strengthen the memory, increase intelligence, bestow eloquence, and guard against evil spirits, among others. Emeralds come in at 7.5 to 8 on the Mohs hardness scale, the same Aquamarine and Morganite. Enhancements: Although cutting is the most basic enhancement method necessary to display the beauty of a gemstone, there are many fascinating methods by which man has demonstrated his ability to draw maximum color, luster, clarity and brilliance from natures earthbound treasures. A basic understanding of these enhancement techniques will add to your appreciation of the beauty, durability and value of the gemstone jewelry you already own, or plan to purchase in the future. Unlike some other gemstones, emeralds almost always contain fissures and/or inclusions when they are mined from the Earth. For this reason, many sophisticated methods are currently used to enhance the clarity of emeralds. Oils, waxes, and resins may be used to penetrate open fissures in the stones. These enhancements are industry accepted, safe and permanent if an emerald is cleaned gently (see "Emerald Care" below. 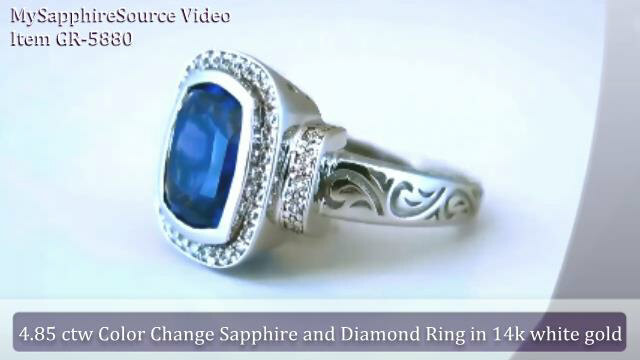 You should assume that the emeralds sold at MySapphireSource and any other fine jewelry store are enhanced these industry accepted methods unless stated otherwise. Buying an Emerald: Emeralds, among the rarest of gemstones, are almost always found with birthmarks, or inclusions. The most important factor to consider is color. The more vivid the green, the more valuable the emerald. Emeralds in sizes over 1 carat are considered to be important stones. At MySapphireSource, we have looked extensively for the finest emeralds displaying the best balance of rich green color and few inclusions. We want you to constantly admire your piece of emerald jewelry so have taken great care to select gemstones that you will be proud to wear. Emerald Care: All emeralds require special care. Do not use an ultrasonic or steam cleaner. Avoid sudden temperature changes, steaming and contact with cosmetics, hairspray, perfume or household chemicals. Clean only with a damp cloth or soft brush with room temperature water. Cleaning in hot, soapy water, solvents (even those made for cleaning jewelry) can cause them irreparable damage to an emerald. Please follow these instructions to keep your emerald looking its best.